Winner of dozens of titles, followed by hundreds and hundreds of thousands of fans in Portugal and abroad, present in the country's top league since its inaugural season and never relegated, home of world-famous megastars like Cristiano Ronaldo and Luís Figo at some point in their career, Sporting CP (occasionally referred to Sporting Lisbon or, in English, Sporting FC) may be second biggest in Lisbon and third biggest in Portugal, but this doesn't make their achievements, their history and their greatness look any smaller. 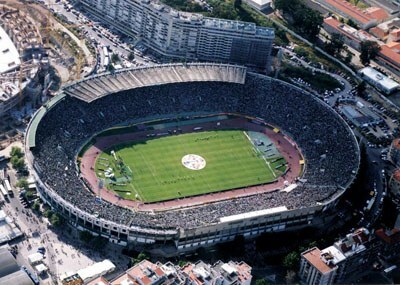 The old Estádio José Alvalade, home of Sporting from 1956 until 2003. Up on the left, the new stadium is seen, while still under construction. Sporting Clube de Portugal were founded in 1906, thanks to a loan that José Alfredo Holtreman Roquette (more commonly known as José Alvalade), one of the club's founders, got from his grandfather, Alfredo Augusto das Neves Holtreman, Viscount of Alvalade. The man whose name is considered synonymous to Sporting (their last three stadiums since the fifties have been named after him) raised the bar from the very first day of the club's existence, setting out to make it not just Portugal's biggest, but one of the most respected in the whole of Europe. Sadly, he died of pneumonia in 1918, aged just 33, so he never got to marvel at the Sporting side that started dominating the Portuguese football scene in the early thirties. The “Lions” won their first title in 1923, when they beat Académica in Faro, in the final of the so-called “Campeonato de Portugal”, a competition that despite including the word “championship” in its name, is considered a predecessor of the Portuguese Cup, the Taça de Portugal. It was in the thirties though that Sporting really started becoming the football colossus they ended up turning into and remain today. In 1933 they lost the Campeonato de Portugal final to Belenenses, but next season they beat Barreirense. Right after that, Portugal started having a proper national championship. Until 1956, in other words, for 24 successive seasons, Sporting were either champions or Cup winners, or they finished second in the championship, or they reached the Cup final but lost it. In some cases, it wasn't “or”, but “and”, as the club won the double (Championship and Cup) in 1941, 1948 and 1954. It was the era of Fernando Peyroteo, José Travassos, Albano Pereira, Jesus Correia and Manuel Vasques, Sporting's legendary "Five Violins", a quintet that led the team to seven championship titles in eight years, starting in 1947. At the top, for a quarter of a century, and that wasn't even the end of it for the “Green and whites”. In 1958 they returned to the top of the Portuguese championship, and spent the next 15 years adding more silverware to the club's collection. Possibly the most precious of all during that period, was the UEFA Cup Winners' Cup trophy won in 1964. On May 13, Sporting faced Budapest's MTK in the final in Brussels, the game ended in a 3-3 draw, and since there were no penalties back then, a rematch had to be played two days later. Another city in Belgium was chosen, Antwerp, and this time the Portuguese protected the 1-0 lead they took early on, to win the trophy. Interestingly, the two clubs have maintained a friendly relationship, and it was Sporting who got invited by MTK to play in Budapest in October 2016, when the Hungarian club inaugurated their new stadium. Probably the most memorable game of Sporting's 1963-64 European campaign though, was the return leg of their quarterfinal against Manchester United. The Red Devils won 4-1 in Manchester in the first leg, but Sporting were absolutely spectacular in Lisbon, they thrashed United 5-0, before eliminating Lyon as well in the semifinals. In 1974, Sporting won the Championship and the Cup in Portugal, they reached the semifinals of the Cup Winners' Cup as well (lost to 1. FC Magdeburg of East Germany), mostly thanks to Argentine striker Héctor Yazalde, scorer of 46 goals in the Primeira Liga alone(! ), in 29 matches. The former Independiente player won the European Golden Shoe, which came with a Toyota car as a welcome bonus. Instead of enjoying his hard-won “gift”, Yazalde sold the car, and shared the money with his teammates, showing them his appreciation for the support they had provided him with throughout the best season in his career. Sporting kept winning titles until 1982, when they actually won the double, the fourth in their history, but what came next was an almost two-decade period without major successes, excluding a Cup triumph in 1995. Eighteen years away from the Primeira Liga top came to an end in 2000, and two years later it got even better, with the club winning their fifth double, in a season that saw Brazilian striker Mário Jardel score an amazing 42 goals in the Championship, to win the European Golden Shoe, the second for a Sporting player after Yazalde's 1974 success. 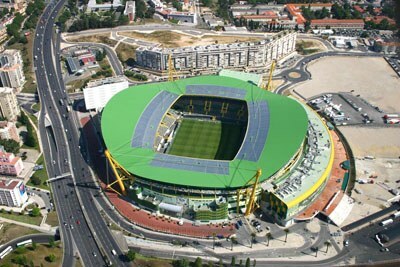 Next season, just before Portugal's 2004 Euro Cup, Sporting entered their modern new home, built right next to their iconic older Estádio José Alvalade, and given the same name. Ironically, not only they haven't won the Championship ever since (they have won the Cup three times though), but they also lost the 2005 UEFA Cup (today's Europa League) final to CSKA Moscow, despite the fact that the game was held exactly at their home. The new Estádio José Alvalade, the "castle" of Sporting since 2003. Hilário Rosário da Conceição, usually simply called Hilário, spent his entire professional career at Sporting, covering the left-back position from 1958 to 1973, and has the honor of being the player with the most appearances wearing the club's jersey, 471 (in official matches). One of his teammates, goalkeeper Vítor Damas, a “Lion” from 1966 to 1976 and then again from 1984 to 1989, is credited by some with many more appearances, but a big number of those were in friendly matches. Fernando Peyroteo, one of Sporting's legendary “Five Violins” in the thirties and forties, top scorer in Portugal's Championship on six occasions, is the club's leading scorer with 543 goals, 635 according to other accounts, including goals scored in friendly games. They may not hold any Sporting record, but it would be impossible to write about the Lisbon's “Green and whites” and not mention Luís Figo and Cristiano Ronaldo. The former spent six years as professional at Sporting, from 1989 to 1995, coming from the club's football academy, and it's from the Lisbon team that Barcelona signed him. As for Ronaldo, he too came out of Sporting's academy, he spent just one season wearing the green and white jersey in the Primeira Liga, and in 2003 he moved to Manchester United, having attracted Sir Alex Ferguson's interest in a friendly game between the two teams. Sporting, or “Sporting Lisbon”, as we tend to erroneously call them outside Portugal, so as to differentiate them from other clubs named “Sporting”, may have not won the championship title since 2002, but they remain one of Portugal's “Big Three” (alongside Benfica and Porto), proud of what they have accomplished in more than 100 years, and fully charged to return to the Primeira Liga's top. The lion has been on Sporting's badge practically since day one (1907, a few months after the club were founded), and comes from the coat of arms of Fernando de Castelo Branco, a Portuguese politician of the late 19th and early 20th century. He was asked by José Alvalade and other founding members of Sporting to allow them to use it on the club's crest, and he agreed, as long as they changed the color (from blue to anything else). Green was chosen, as the color of hope. The current logo has been in use since 2001, and its main difference to the five previous ones is that the lion is yellow-ish.